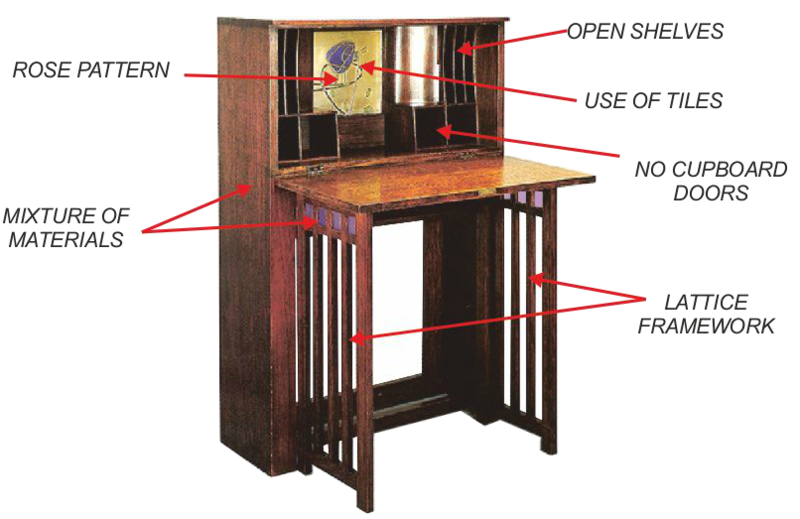 The desk shown below was designed by Charles Rennie Mackintosh. Identify all the typical Mackintosh features, incorporated into many of his designs. Mackintosh furniture has certain design characteristics. Many of these are listed below. Underline those characteristics (even single words), that apply to the desk shown above. Functional, Stylish and yet simplistic. Limited decoration, with pattern and ornament minimised. Use of floral patterns/motifs/forms, as seen in his stain glass designs, and applied to furniture. Use of texture, light and shadow - tactile. Powerful use of right angles, use of squares and rectangles with subtle curves. Floral motifs / rose motif. Combined materials such as stain glass and natural wood.